For a walk-through lesson in America`s history, the The Freedom Trail is a route through downtown Boston, the North End and Charlestown and takes about 4 hours to walk comfortably and is an interesting introduction to this charming city. Boston really is a “city of culture”, with world class cultural attractions such as the Museum of Fine Arts and in Cambridge you can take a free tour of the MIT – Massachusetts Institute of Technology and Harvard University. 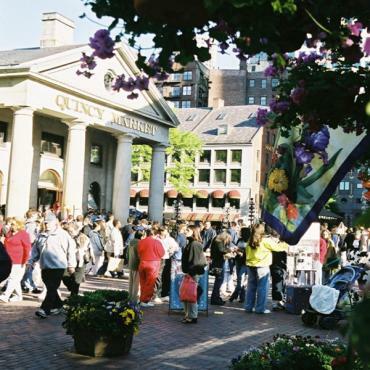 Quincy Market and Faneuil Hall have a “Covent Garden” feel and are full of lively shops and restaurants and in the very heart of the City is Boston Common were you can stroll or bike round the 50 acres or take a boat trip on the lake. The best sightseeing options include the Old Town Trolley tours, Duck tours and Whale Watching cruises. And of course when it comes to shopping Boston has it all from department stores to individual boutiques, antiques to contemporary crafts and Armani to Gap! Clothing under $175 in Massachusetts is generally tax free so adds to even better savings! !